Tibi, that is one of the most significant tablet chocolate brands, has been present in the Hungarian market for more than 70 years. Chocolate lovers could take’tibi’ that was named after the grandson of factory founder, from the shop shelves first in 1941. The corded shaped chocolates originally intended for children could be bought in 2,5 and 5 dkg sizes. 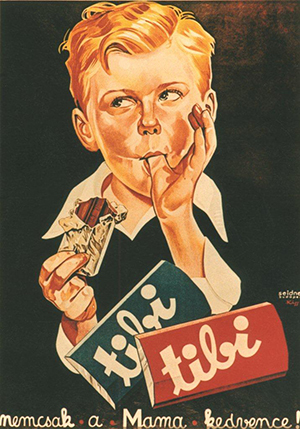 The slogan “tibi is not only mums’ favourite” advertised the chocolate on posters. 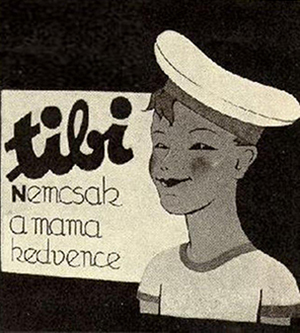 As a result of the widespread advertising campaign the product became popular among adults, too, so the original slogan had to be changed soon in Hungary as well as in abroad: “tibi is not only children’s favourite”. Tibi was one of the few brands that remained in the product portfolio after the nationalization in 1948, and it is produced by Bonbonetti Ltd. even today. Tibi’s form and packaging has been changed many times in the last 70 years, its portfolio has been widened by many new products and as a result it is a well-known and popular brand even today. If you placed all the tablets produced in a year upon one another, you could build a giant tower reaching the top of Mount Everest or 15 official soccer fields could be covered with them. There is only one thing that has remained unchanged: ‘tibi’ logo is exactly the same as originally. With its name written with childishly curly small letters, ‘tibi’ is the only brand among the great traditional chocolates that is still being has produced in Hungary, in Bonbonetti Group’s factory in Budapest. 40g ‘tibi’ bars that are delicate fusions of the creamy filling and cocoa were launched in 2010. The marzipan dark chocolate bar as well as the truffle and cottage cheese-lemon flavoured milk bars let the consumers relax during the running weekdays, too. In 2017 – beside the well-known tablets – new members of the tibi product family appeared on shelves in the new form of boxed chocolate. Besides the popular tastes, ‘tibi’ tablet portfolio is regularly widened by new variants. Nowadays you can enjoy ‘tibi’ not only in form of tablets, but as Christmas candies, Christmas or Easter gift packs. Santa Claus and Easter Bunny figures are also branded with the popular logo.